OKW Electronics, Inc has launched a new website to help customers find the components they need quickly and easily. OKW has one key objective for its new website: to make searching for the right electronic or electrical components swift, simple and hassle-free. Customers can find their product with just a few clicks - ­ instead of having to visit many pages and search through long ordering tables. The new website’s search function homes in on the right product with each successive click by a customer. It reduces the number of products listed each time the customer selects a product parameter -­ such as searching for PCB terminal blocks by pitch, poles, termination, rating, voltage and wire gauge. The all-new site - ­ which replaces the previous versions ­ - also includes more technical information and downloadable datasheets. 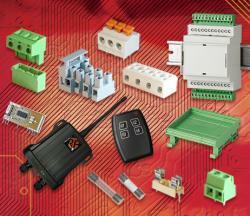 OKW’s UL, CE, VDE and IMQ approved PCB terminal blocks include pluggable and PCB mount models. They come in all the main pitch sizes (3.5 mm to 10.16 mm) and are fitted with screw clamp, wire protector or high quality rising clamp fixings for 30 to 6 AWG wire sizes. The new website enables users to search rapidly through a huge range of flanged, low profile, standard profile, pin strip, crimp, multi level, inline screw, high current and screwless PCB terminal blocks. OKW’s large range of electrical connectors includes terminal strips, barrier strips, high temperature and push-in fast connection blocks. Terminal strips can be supplied in 12 pole strips (17.5A to 125A/450V or 600V). PCB and chassis mount dual barrier strip pitches range from 6.35 mm to 11 mm. They are rated 10A to 25A/300V. OKW’s DIN rail enclosure ranges are manufactured to DIN 46277-3 (EN 50022) specifications for mounting to TH35 type rails (or TH15/G32 rails by adding an adaptor). They are available in sizes from 1 to 12 modules wide with a standard height of 90 mm and depth of 58 mm. PCBs can be fitted either horizontally or vertically on screw pillars and guide grooves in the tops and bases. OKW’s DIN rail PCB holders are extremely versatile, enabling the building of interfaces for connectors, relays, opto couplers, switches, fuses, diodes, power supplies, analog to digital converters and circuit protection. They clip on to TH35 and G32 DIN rails. PCBs (72 mm or 107 mm wide) are held in place by guide rails in the holder base sections. Extruded holders can be custom-cut to the precise length of the PCB. OKW Electronics’ big range of fuses (50mA and 32A) and fuse holders are suitable for applications including micro circuits, general power, semiconductors, motor circuits and photovoltaic circuits. Fuses are available as fast acting or time delay. Fuse holder ranges are available for PCB, chassis and panel mount applications. OKW’s battery balancers extend the life of cells by 10 per cent by ensuring that they are charged evenly. Four models of battery balancer are available ­ - 6V, 8V, 12V or 15V ­ - with a maximum current flow of 1A. The units are protected against dust and water ingress for use in challenging environments. OKW Electronics, Inc Vice President, Sales, Sean Bailey said: “Anyone who has bought from OKW Electronics, Inc knows what a huge range of components we offer. “Now it’s even quicker to browse that range online, making the ordering process even easier,” he added. OKW Electronics’ new website was built by digital agency Intergage using its patented content management system. The Intergage content management system is easy to use and highly intuitive. It has been designed to enable clients to edit their websites with the minimum time and effort. For more information about OKW Electronics components, contact Vice President, Sales, Sean Bailey, Phone: 866 603 7701. OKW is the exclusive North American distributor for UK electronic components manufacturer CamdenBoss. OKW also represents RF Solutions Ltd which manufactures keyless FM remote control systems, RF modules, systems and antennas for 433.92 MHz applications.